Having spoken to several brewers over the years and also being a home brewer myself, I have discovered that there are three main creative goals that inspire a brewer to create a particular beer. The creative goals are desired taste, ingredients to be used to make said beer, and a commemoration. The creative goals can be independent or a combination of one another, and no matter which ones are used they can create equally great beers. The brewer that creates beer to have a desired taste can usually imagine the flavors and aroma of the beer much like an architect can visualize a building before he or she draws it. The brewer can also be inspired by another brewer’s beer and try to duplicate it. If the duplicated beer is a near perfect match, it is called a clone, but if instead the brewer puts his own twist on it, it would be considered his own. I should point out that it is very difficult to duplicate someone else’s beer even if you have the original recipe. This is due to the fact that each brewer’s equipment, yeast strain and sometimes even the brewer’s brewhouse environment can play a role in the final flavor of the beer. 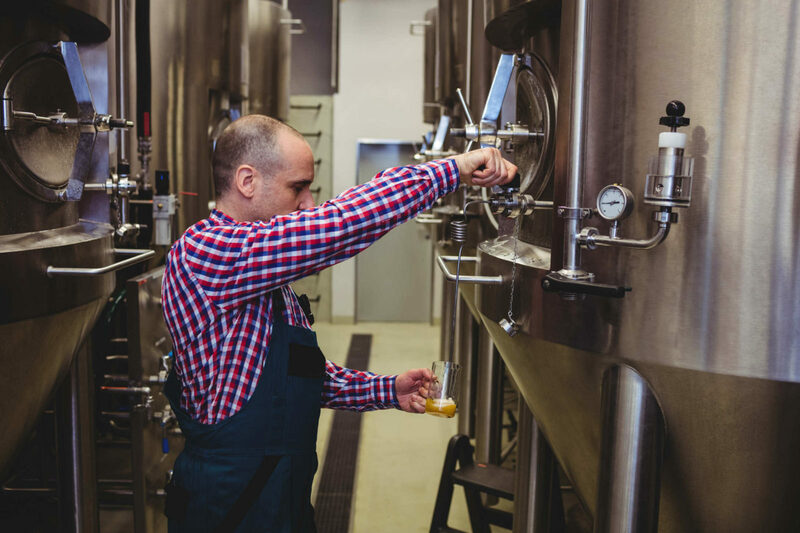 Similar to an architect, or any creative person for that matter, the brewer will sometimes change direction during the creative process after he or she gets inspired by an unexpected flavor or aroma as it presents itself. An example might be a brewer working on an IPA who inadvertently mashed the grain of his experimental beer at a higher temperature which in turn resulted in a fuller bodied beer with great mouth feel. In this scenario, the brewer liked the results of the higher mash temperature so well, he decided to keep the higher mash temperature in the recipe, but he also added more bittering hops to balance out the sweetness that was caused by mashing at the higher temperature. When brewing beer it is important to remember that one change in the recipe will usually dictate at least one other to keep everything in balance. When the ingredients are the creative focus, the brewer might simply be trying to use leftover ingredients much like a chef sometimes creates fabulous dishes from leftover ingredients. A good brewer can look at the malts and hops he or she has and come up with a recipe. The new recipe might be something simple like adding some leftover crystal 55L malt to an imperial IPA which will give it more color, body and a sweeter flavor or he or she might instead use crystal 120 malt and some extra hops to make a red IPA. Some brewers will even buy specialty grains or hops without a recipe in mind for their use. In this scenario the brewer is so inspired by the ingredients that he or she lets the ingredients speak to him or her through color, texture, taste and smell and creates a recipe to showcase those characteristics. I have been told by many brewers that you should always taste everything you put into your beer and preferably at every step along the way. The only exception is the hops. Hops should be smelled, but never tasted unless diluted hopefully in beer or wort. I did however; meet a brewer on one of my beer tours that said he tried tasting a hop pellet once. He said it burned so bad he could not taste anything for a week afterwards. When creating a beer as a commemoration, the brewer is usually combining the creative goals of taste and the ingredients to be used. The point of a commemorative beer is to celebrate or represent a person, place, thing or event. The commemoration might be sports related, a destination or even something that happens in nature such as a phenomenon that happens with sunlight. When a commemoration is the goal, all aspects of the beer can come into play as a means of representation. The color of the beer might be the focus to represent the sun setting when the brewer was on Safari in South Africa. In this case the brewer might add a lot of crystal 120L malt and maybe even some beets to create a nice red hue. Aroma and taste can also be the focus such as when tropical fruit is added along with citrusy hops to emulate the flavors and smells of a tropical island. No matter what is being commemorated, a creative brewer can figure out how to represent it. Unless you talk directly with the brewer it is hard to know which creative goals were used to create a particular beer. The name of the beer can sometimes offer clues. If the name of the beer includes a well known name or depicts an event the creative focus was probably a commemoration. If the beer has the name of adjuncts in the beer’s name such as “Honey Apple Blond”, it was probably created using taste as the focus, but it could also have been created with the ingredients in mind as the creative goal. As a consumer of the brewer’s creations, we should respect what inspires the brewer. Even if we do not like what the commemoration is about or how the brewer came about creating the recipe, if we like the end product does the rest really matter? If it is the name of the beer that bothers you, consider politely telling the staff at the brewery as you might not be the only person with similar feelings about the name and the brewery might actually sell more of that beer under a different name. Beer name changes have occurred before, usually for trade name infringements, but also for lack of sales under a previous name. Regardless of the creative goals used, the brewer should use whatever goals work best for her or him and the consumer should at least try a sample of their beer.